Pre-heat the oven to Gas Mark 4 (350°F/180°C). Brown the minced beef in a frying pan, adding a little oil or butter if necessary. Peel and chop the onion finely and add to the minced beef. When the minced beef and onions are browned, season with salt and pepper and add the stock. Allow to cook for about 15 minutes. 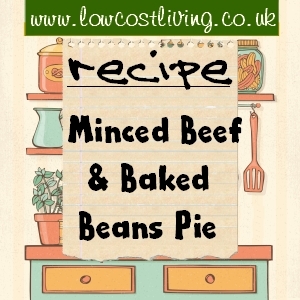 Pour the meat mixture into a lightly greased pie dish or shallow casserole and top with the baked beans – spreading them evenly over the top. Make sure that the mashed potatoes are smooth, beat with a mixer and add a knob of butter and a little milk until really creamy. Spread over the the surface of the beans, making a design with a fork. Dot with butter (if you like) and put into the oven for about 30 minutes. Serves 4 – Goes down well with kids. A sprinkling of grated cheese over the top of the pie before it is put in the oven, works well.